This is on my mind right now because I'm on my way to a writers conference in Boston, and I can't wait for the weekend! There's something invigorating and motivating about attending a well-run writing conference. Because I live on the east coast, I tend to gravitate toward conferences in the northeast. My three favorite conferences that I've attended are the New Jersey Romance Writers' "Put Your Heart into a Book Conference", the RWA National Conference (when it's on the east coast, because I don't fly! ), and New England Chapter of Romance Writers of America's "Let Your Imagination Take Flight Conference." Why are conferences valuable to me? 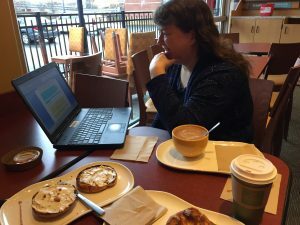 My critique partner, Author Dorothy Callahan, looks over my pitch for my editor appointment this weekend at the New England conference. 8. I get to meet lots of very successful writers who inspire me to never give up. If you're already writing and haven't attended any conferences, do it! If you're just exploring the idea of writing a book, attend one! It might seem intimidating the first time because you see all of these people who are published or hoping to be and you think you're not equal to them. Not true! They're all happy to share their journey with you so that maybe you'll avoid some of the frustrations or pitfalls that almost every writer experiences. So, with that being said, wish me luck this weekend. I'm hoping an editor will want to take a look at my book. I mean, after all, the NY Times Bestseller List is just waiting for me! ← It’s a Title! What’s the big deal?